Pioneers in the development of implantable intraocular lens materials, ISO/FDA testing protocols, and inspiration-to-approval project design, the scientists at InVision Biomedical have consistently provided successful outcomes for ophthalmic biomedical device innovators. Contact us to learn more. InVision Biomedical is a leading ophthalmic intraocular research and technology center in Orange County. Principals of the firm, F. Richard Christ and Marie Dvorak Christ, Ph.D., head the scientific team. Need ophthalmic device materials research, development, and consulting services? InVision Biomedical is the leading ophthalmic materials research and technology center. Request ophthalmic device materials services. With its Design and Prototyping facility, InVision Biomedical is equipped to manufacture various types of intraocular lens designs. We can make your "back-of-the-envelope" concepts a reality. Request info about ophthalmic device design and prototyping. 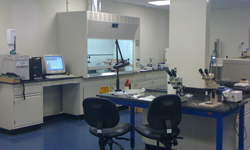 With its full "state-of-the-art" lab in Irvine, CA, InVision Biomedical provides testing and technical strategy services for the submission of FDA (IDE, 510k, and PMA) and CE regulatory filings. Request more information on FDA and CE regulatory filings.